Upon learning that I was moving to Wisconsin, an elderly couple in my Lutheran Church back in MI thought I should prepare for living in Wisconsin. Both had previously lived in WI, one while attending University of WI in Madison and his wife was from a non German, Irish Community in the suburbs of Milwaukee. Before church they told me to meet them in the parking lot, at the conclusion of the service. I was curious and hoped it had nothing to do with football. So an hour later we met at their car and they proudly handed over an awkward heavy bag. I was clueless. I peeked into the bag and found an expensive bottle of Brandy with twin cans of 7-Up. I thanked them and I asked what I should do with the contents. They said I must know when entertaining neighbors, that they will expect Brandy and Sweets. The wife suggested a glass of Brandy topped off with a little 7-Up would be tasty. I had always thought the favored beverage was beer. I took the gift and have yet to use it. I should add that another man from church told me that he heard that if you are driving through WI and get thirsty you can simple stop at a farmhouse and the owner will offer you a cold beer. A Michigan myth no doubt, and he might be confused with the house-like bars that are found on every corner with an “Old Style” Sign hanging from a shingle out front. As for semantic differences, I try to remember to call pop, soda and the drinking fountains, bubblers. If we are going Up North I have learned to say heading to the North Woods. I have been unable to alter my Ohio accents (I have often been asked if I am from Ohio). And when I say I am from MI, I qualify it by saying the Lower Peninsula, which usually results in surprised looks and comments of “You mean there are two peninsulas”? I then hold up my hand to point to the base of the little finger and if they are still confused..I simple say due East of Sturgeon Bay across Lake MI. 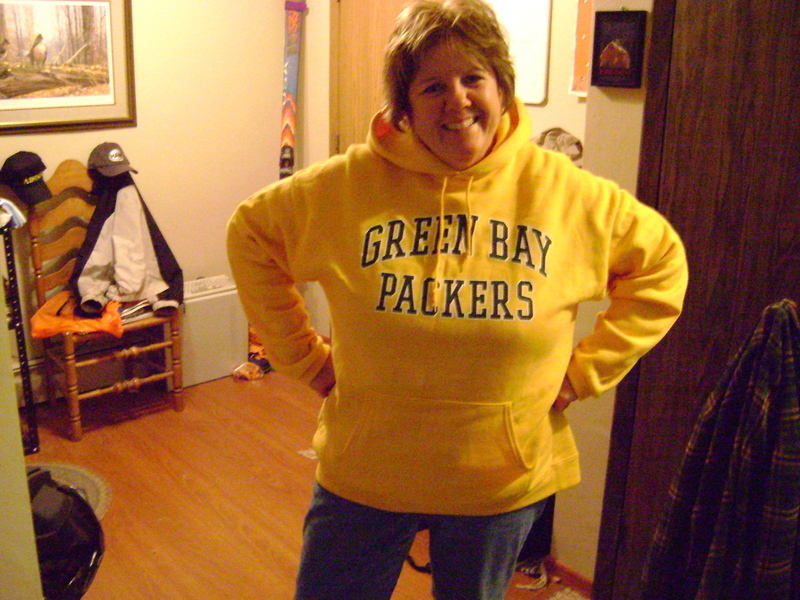 Football is big as you might have heard, I have my trusty Packer sweatshirt, but no bumper stickers, car or house flags, cheese-head wear, memorabilia altar in the living room, or a Packer man cave. Once football season arrives, I can expect to clear the weekend calendar. Two years ago my husband got tickets to an October game at Lambeau Field. To my amazement, the greater Green Bay area turned into a green and yellow circus : people regaled in extensive and expensive Packer wear, surrounding lawns turned into parking lots and tailgate parties, that had begun at daybreak or the night before, were still humming in the stadium parking lot right up to game time . And let’s not forget the traditional fly over by the local arm forces to top off the start of the game. Football is big business and fun. Aside from all I have done in the eight months since I have moved here, I have a small list of things I want to do in the near future. I want to polka to a German style band, I want to cook up a big crock pot of sauerkraut with Usinger Sausages, go out for Friday fish at a local supper club, find the Oshgosh B’Gosh outlet, and have a bottle of beer at a local Bier Garten, there is one on every corner, just about. Speaking of beer, it would be fun to tour a brewery, not Miller, but Leinenkugal over in Eau Claire. And finally, this summer I want to host a rummage from my garage. If you find any of these things on your list or would like to join me checking things off my list, stop by for a visit this summer.